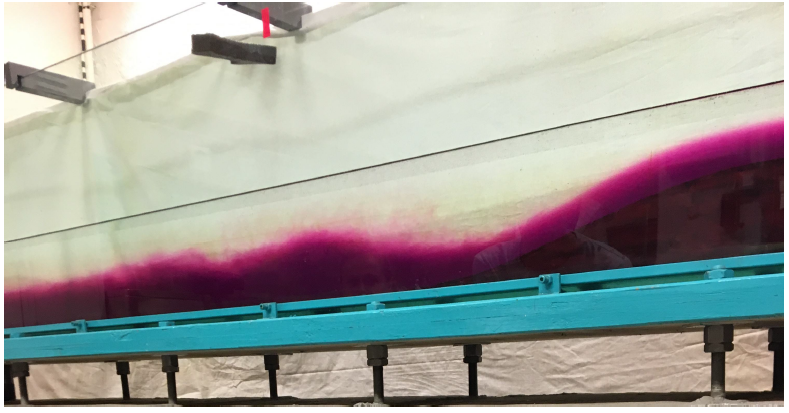 In order to observe Lee Waves and their related phenomenon, an experiment was conducted in a large water tank with a stratified two layer system. The two layer system was constructed with fresh water sitting atop colder salt water. The fresh water had a salinity of about 0‰, with a density of 1000 kg/m3 while the pink-dyed salt water had a salinity of about 35‰, and a density of 1028 kg/m3. In order to force Lee Waves to propagate, a mountain was moved along the bottom at two different speeds, fast and slow. While conducting an experiment to visualize Lee Waves, the phenomenon of the hydraulic jump can be observed. 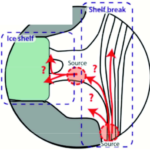 This event can be visualized when water flows over rocks or even in one’s kitchen sink. This occurs when water flowing over a surface goes from subcritical to supercritical, which is calculated through the Froude number. To calculate this, the velocity of the flow is divided by the phase speed of the shallow water gravity waves. The square root of this fraction is then taken to provide a unitless value called the Froude number. The result is either greater than one (supercritical) or less than one (subcritical). Supercritical Froude numbers indicate that waves cannot propagate upstream. This can physically be visualized when the flow over the observed surface goes from smooth and rather thin, to turbulent and rough. As we pushed the mountains through the stratified water, the denser saltwater (shown with pink dye) was forced up and over the mountain, resulting in turbulent motion just behind the surface anomaly. As the thinner flowing water moved from the downhill slope of the mountain to just downstream and onto the bottom of the tank, the flow went from smooth to rather chaotic. The interface where the flow becomes turbulent is the hydraulic jump. The smoother water flowing over the mountain is supercritical while the more mixed water just downstream is the subcritical flow. When the mountain was moved at the faster speed, this hydraulic jump was shifted accordingly. Instead of the hydraulic jump occurring just behind the mountain, the waves seemed to lag with the more turbulent flow occurring farther downstream than with the slower mountain speed. 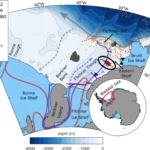 Why is the Antarctic Ice Sheet melting? 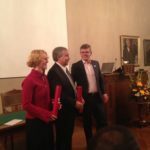 Elin receives award for polar sciences! 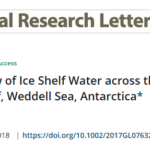 The ice shelves fringing the Antarctic continent are melting at an accelerating rate. 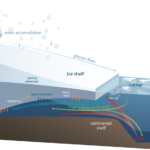 Most of the melt happens from below, as warm ocean currents eat away the undersides of the ice. How exactly does this work, and how do we know? Read our blog and find out! Why do we do this cruise? 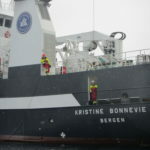 First paper from our Amundsen moorings published!